Chile-spiced nuts. In one Harvard study, women who ate nuts two or more times a week gained less weight than women who rarely noshed on them. Although nuts are high in calories, researchers think that the combination of protein, fiber and healthy fats help keep you feeling full. And going for nuts with a little zing (find recipes here!) may even help boost your metabolism. Studies suggest that capsaicin, an antioxidant in chile peppers (and also what makes them hot), increases the body’s metabolic rate—slightly—and may stimulate brain chemicals in a way that helps you feel satisfied. Popcorn. 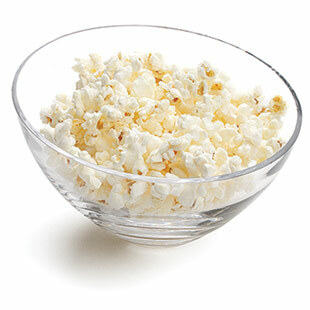 Don’t forget: this movie-theater favorite is a whole grain and has only 20 calories per cup (just skip the butter). Plus, as Ana Mantica reported in EatingWell Magazine, swapping refined grains for whole grains may help reduce total body fat and belly fat, swapping refined grains for whole grains may help reduce total body fat and belly fat, according to research in the Journal of Nutrition. In this study, people who ate about 3 servings of whole grains a day had about 2.4 percent less body fat and 3.6 percent less abdominal fat than those who ate less than a quarter of a serving. Fiber from whole grains may help you feel full on fewer calories—and possibly fuller than fiber from other sources, such as fruit and vegetables, the authors speculated. Whole-grain cereal-based snack mix. To make one of my go-to snacks, I toss about 3/4 cup of a low-sugar, high-fiber (but oh-so-delicious) cereal into a small container with 12 almonds (that’s about 1/2 ounce). It’s an easy-to-eat-on-the-run, filling snack or breakfast that delivers whole grains and nuts and lots of staying power for only 175 calories. Sometimes, I sweeten it up with a tablespoon or two of raisins.